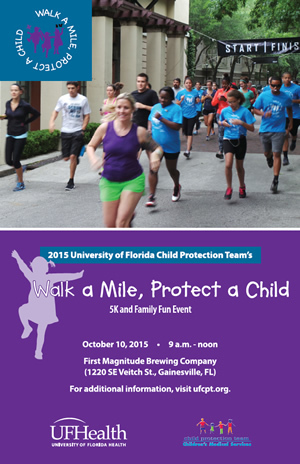 Mark your calendars now and come out and join us for the 2015 Walk a Mile, Protect a Child 5K race to benefit the University of Florida Child Protection Team. The 4th Annual University of Florida Walk a Mile, Protect a Child benefiting the children and families served by the Child Protection Team is a family fun event to help raise awareness of the effects of child abuse and the challenges our children face. On-site registration for the 5k begins at 9am with the race starting at 10am. The race route follows the Hawtorne Trail. There will be free children’s activities and family games from 9am until 1pm.